Staff selection commission every year conducting the national level written examination for the recruitment JE junior Engineer for Civil, Electrical & Mechanical trade. 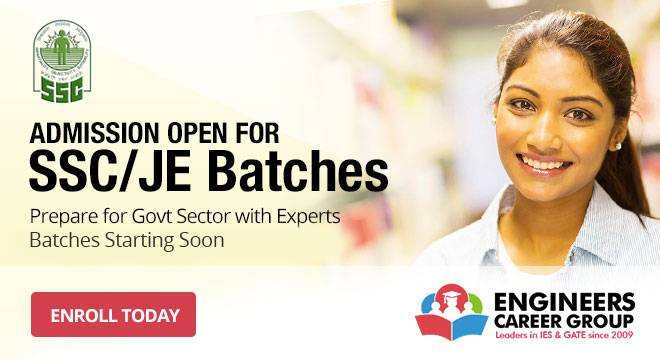 The SSC-JE Exam will be held to recruit suitable candidates for the post of Junior Engineer in various government organizations. Candidates shall be screened via a two tier selection process which consists of written examination and personal interview. Posts for recruitment and the respective departments are given where which will recruit the candidates thru the examination. Before filling the SSC JE application form, candidates must mandatorily refer to the eligibility criteria in detail and know all the clauses. If a candidate fills the application without meeting these terms, he will be rejected in the document verification process. d. A person of Indian origin who has migrated from Pakistan, Burma, Sri Lanka, East African countries of Kenya, Uganda, the United Republic of Tanzania (Formerly Tanganyika and Zanzibar), Zambia, Malawi, Zaire, Ethiopia and Vietnam to permanently settle in India. Note: If a candidate is not an Indian citizen, he must produce a certificate of eligibility that has been issued by the Government of India. (I) 18 to 27 years age for JE (Civil & Electrical) in CPWD and Department of Posts. (II) Up to 30 years for JE (Civil) and Junior Engineer (Electrical & Mechanical) in MES. (III) Up to 32 years for JE (Civil & Mechanical) in CWC and Farakka Barrage. (IV) 18 to 27 years of age for Junior Engineers (Quantity Surveying and Contract) in MES. (V) Up to 30 years of age for Junior Engineer (Civil) and JE (Electrical & Mechanical) in Border Roads Organization (BRO) of Ministry of Defense. Note: Age concession and relaxation will be applied for SC/ST/PwD and Ex-servicemen candidates, as per the regulations of Government of India. SSC JE (Civil), Border Roads Organization (BRO) Ministry of Defense – Three years Diploma in Civil Engineering or equivalent from a recognized University or Institute (Desirable – Two years working experience in the field of civil construction in monitoring and executive of projects). SSC JE (Electrical and Mechanical), Border Roads Organization (BRO) Ministry of Defense – Three years Diploma in Engineering (Electrical or Mechanical) from a recognized University or Institute (Desirable – Two years working experience in the field of Electrical or Mechanical Engineering in the area of construction in monitoring and executive of projects). SSC JE (Civil & Electrical), CPWD – Diploma in Civil, Electrical or Mechanical Engineering from an institution recognized by the Central Government or equivalent qualification. SSC JE (Civil & Electrical), Department of Posts -Three years Diploma or equivalent in Civil Engineering or Electrical Engineering from an institution recognized by the Central Government or State Government. Junior Engineer (QS&C) MES – (i) 3 years Diploma in Civil engineering from a recognized institute/University/Board or equivalent; OR (ii) Passed Intermediate examination in Building and Quantity Surveying Sub Divisional -II of the institute of Surveyors (India). Junior Engineer (Civil & Mechanical), CWC and Farakka Barrage – Degree or Diploma in Civil or Mechanical Engineering from a recognised University or Institution. Junior Engineer (Civil), MES – Degree in Civil Engineering from a recognized University OR I) Three years Diploma in Civil Engineering from a recognized Institute or University or Board; and (II) Two years experience in Planning, Execution and Maintenance of Civil Engineering works. Junior Engineer (Electrical & Mechanical), MES – Degree in Electrical or Mechanical Engineering from a recognized University; OR (I) Three years diploma in Electrical or Mechanical Engineering from a recognized Institute or University or Board; and (II) Two years experience in Planning, Execution and Maintenance of Electrical or Mechanical Engineering works. Engineers Career Group is one of the best SSC JE coaching institutes in Chandigarh. We offer all the technical branches preparation for SSC JE coaching in Mechanical Engineering, Electrical Engineering & Civil Engineering. We have Specialized teacher for teaching our students in a better way.